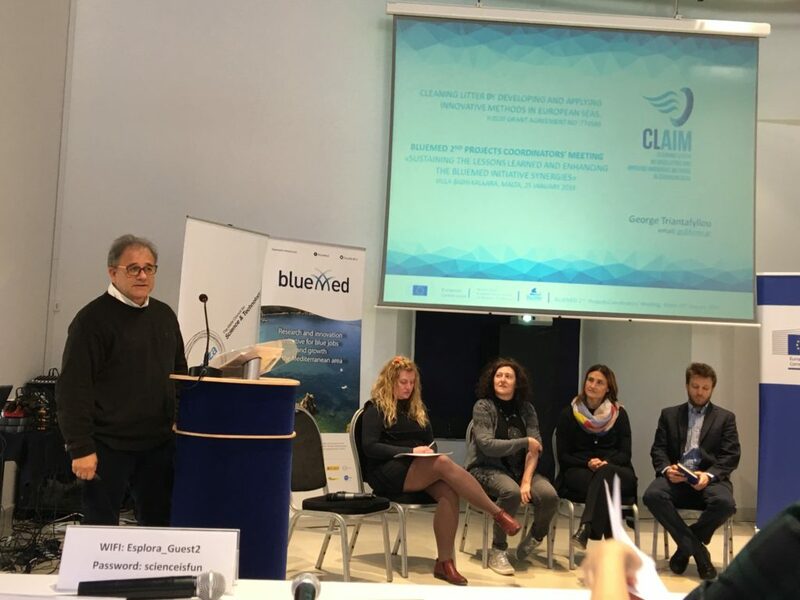 CLAIM’s coordinator Dr. George Triantafyllou participated on Friday 25th January 2019 in the BLUEMED 2nd Project Coordinators’ Meeting: Sustaining the lessons learned and enhancing the Bluemed Initiative synergies, after an invitation of the Maltese Horizon 2020 National Contact Point and Executive – Projects Implementation Unit. The event took place in the Planetarium – Villa Bighi, in Kalkara, Malta in collaboration with the EC – DG RTD. 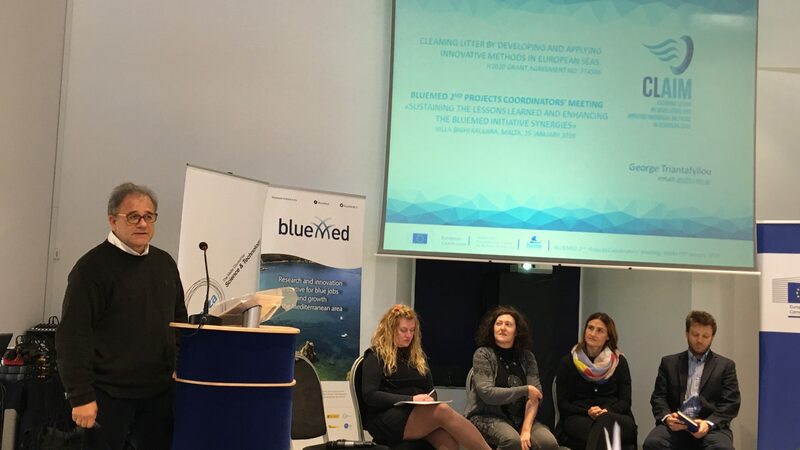 Dr. Triantafyllou participated in a panel discussion – “Taking stock of the challenges and opportunities of the Mediterranean Sea – Scoping the Impact of the BLUEMED Initiative” and analysed the Assessment of Research and Innovation results of the CLAIM project contributing to the implementation of the BLUEMED Initiative. The CLAIM project meets all three Pillars of the BLUEMED Initiative and contributes to 3 out of 4 Challenges of the Knowledge Pillar, 5 out of 5 Challenges of the Economy Pillar and to 3 out of 4 Challenges of the Technology Pillar. In addition, it contributes to 2 out of 5 goals of the Cross Cutting Enablers. The above are achieved through the 5 innovative marine cleaning technologies that are developed to prevent litter from entering the sea at two main source points: wastewater treatment plants and river mouths. In addition, the CLAIM network of FerryBox systems that will operate on ships in West & East Mediterranean mounted with an automated seawater sampling device & passive flow-through filtering system as well as the development of innovative modelling tools to assess and create informative maps about visible and invisible marine plastic pollution at basin and regional scales, further contribute to the implementation of the BLUEMED strategic research and innovation agenda. Last, but not least, an ecosystems approach will guide the CLAIM project through the evaluation of the potential benefit from proposed litter cleaning methods to ecosystem services and human well-being. New business models will enhance the economic feasibility for upscaling the innovative cleaning technologies, taking into account the existing legal and policy frameworks in the CLAIM countries, as well as acceptance of the new technologies by their end-users and relevant stakeholders. The event revolved around key actions and achievements of EU funded projects, with a view to tapping the lessons learned within the blue growth community in the Mediterranean, in order to foster the transformation of the Mediterranean basin into a hotspot of innovation.